Our butternut squash lasagne is legendary, and it’s got a lovely story behind it too. This is one of the favourite recipes I would make for my family, but it wasn’t quick to make! So, I starting batch cooking the lasagne in advance and freezing. Not long after, friends and family were asking for some, then friends of friends and before you know it I had outgrown the kitchen keeping up with demand! And now you can get in on the action! 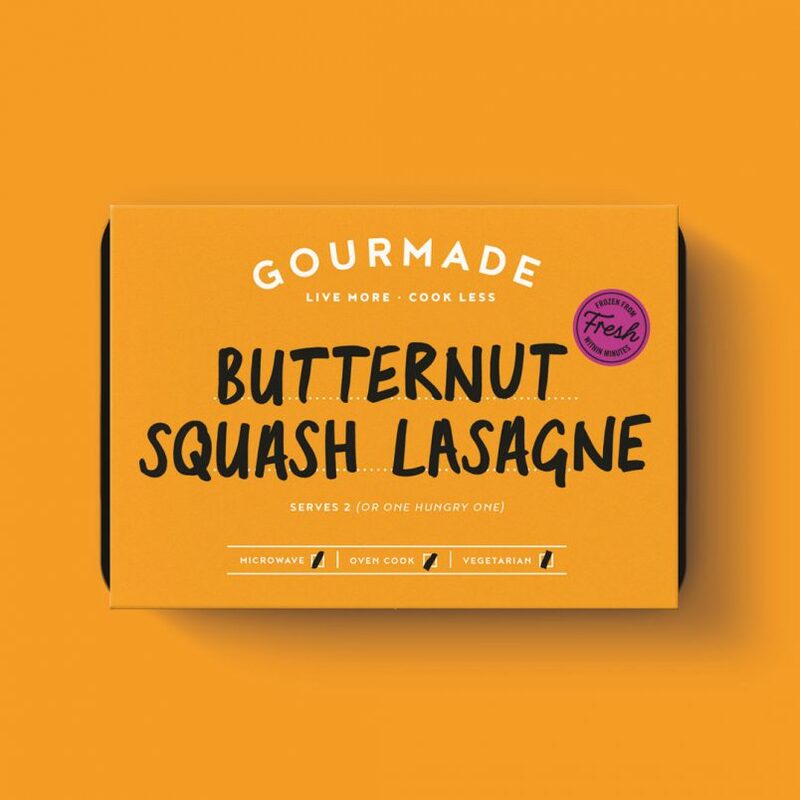 Our popular vegetarian dish is loaded with layers of butternut squash, courgette, sweet potato, in a rich tomato ragu, then topped with a creamy spinach and mature cheddar béchamel…it’s a winner! Enjoy! Chopped Tomatoes, Milk, Lasagne (11%) [Durum Wheat Semolina, Water, Whole Egg Powder], Butternut Squash (8%), Courgette (8%), Mature Cheddar Cheese (Milk) (7%), Sweet Potato (6%), Red Onions (5%), Slow Roasted Tomatoes (Tomatoes, Tomato Concentrate, Sunflower Oil, Olive Oil, Salt, Oregano, Sugar, Garlic), Whipping Cream (Milk), Spinach, Unsalted Butter (Milk), Tomato Puree, Water, Rapeseed Oil, Vegetable Stock Mix [Vegetable Stock (Water, Onion, Carrot Extract, Tomato, Celeriac, Herbs, Garlic, Spices), Salt, Glucose Syrup, Maltodextrin, Yeast Extract, Natural Flavourings, Rapeseed Oil], Corn Flour, Italian Style Hard Cheese (Milk), Sugar, Modified Maize Starch, Dijon Mustard [Water, Mustard Seeds, Vinegar, Salt], Basil, Garlic Puree, Balsamic Vinegar, Salt, Cracked Black Pepper, Ground Black Pepper, Ground Nutmeg, Ground White Pepper, Ground Bay. 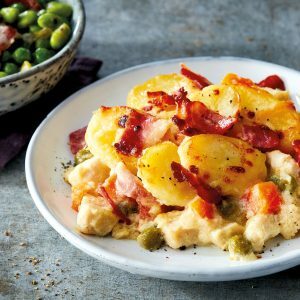 Chopped Tomatoes, Milk, Lasagne (11%) [Durum Wheat Semolina, Water, Whole Egg Powder], Butternut Squash (8%), Courgette (8%), Mature Cheddar Cheese (Milk) (7%), Sweet Potato (6%), Red Onions (5%), Slow Roasted Tomatoes (Tomatoes, Tomato Concentrate, Sunflower Oil, Olive Oil, Salt, Oregano, Sugar, Garlic), Whipping Cream (Milk), Spinach, Unsalted Butter (Milk), Tomato Puree, Water, Rapeseed Oil, Vegetable Stock Mix [Vegetable Stock (Water, Onion, Carrot Extract, Tomato, Celeriac, Herbs, Garlic, Spices), Salt, Glucose Syrup, Maltodextrin, Yeast Extract, Natural Flavourings, Rapeseed Oil], Corn Flour, Italian Style Hard Cheese (Milk), Sugar, Modified Maize Starch, Dijon Mustard (Water, Mustard Seeds, Vinegar, Salt), Basil, Garlic Puree, Balsamic Vinegar, Salt, Cracked Black Pepper, Ground Black Pepper, Ground Nutmeg, Ground White Pepper, Ground Bay. This was our first Gourmade meal, and it certainly won’t be our last We enjoyed every single mouthful. Brilliant! 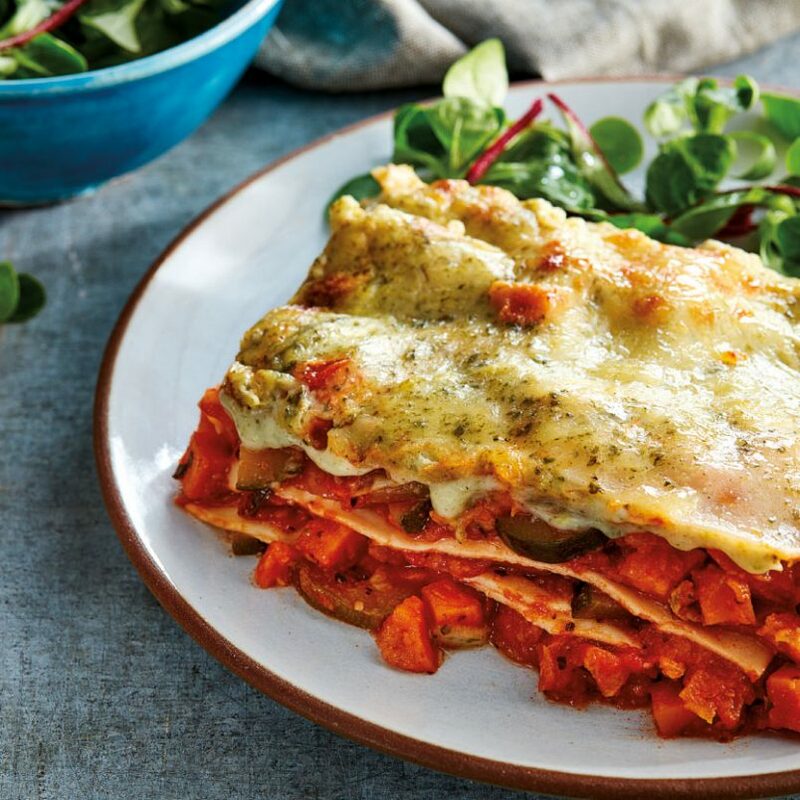 What a lovely twist on traditional lasagne! Really tasty yet feels so healthy too!